GOLDEN Colo., Summer, 2017…Summer in Golden – could it be any lovelier? Walk along Clear Creek and watch the kayakers and fly fishers at play. Earn bragging rights by biking up Lookout Mountain. Shop for sporty summer outfits, check out the unique shops and enjoy an ice cream cone while walking along Washington Avenue. Catch a movie & music in Parfet Park. Browse top quality artwork at the Golden Fine Arts Festival. Golden is a perfect summer escape! Golden is an ideal spot for visiting family & friends…Ahh! Summer in Colorado! Concerts at Red Rocks, craft beer on sunny patios, hikes in the glorious mountains and….out-of-state friends and family clamoring to visit! Do you have friends and family visiting this summer? 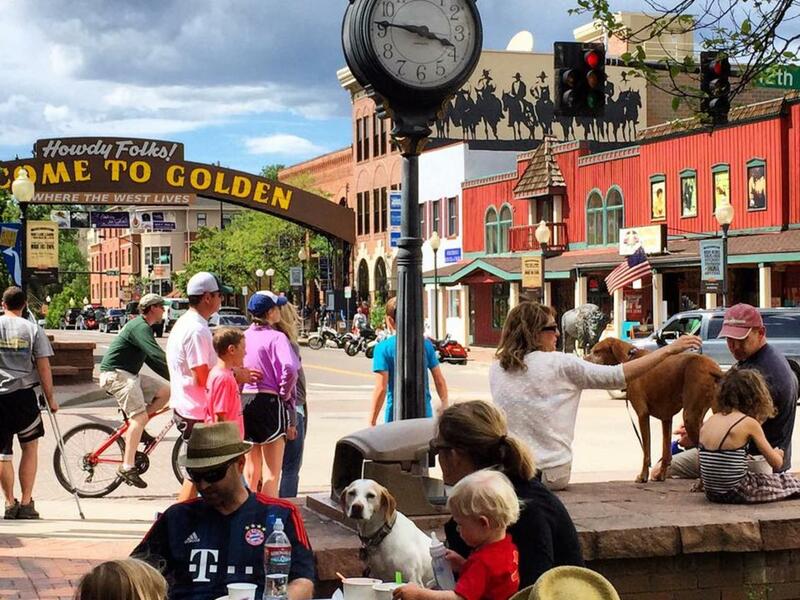 Here are nine reasons to bring them to Golden to easily experience the best of Colorado. Beignets by Clear Creek? Yes, please! – Southern cooking comes to Golden! Sassafras American Eatery is now on Washington Avenue near Clear Creek. Specializing in Southern comfort food made with locally-sourced and organic ingredients, this delicious restaurant is a tasty addition to Golden’s restaurant scene. Ben Butler’s Sculptures to Highlight Foothills Art Center’s Summer Season – Acclaimed artist Ben Butler brings his unique wooden sculptures to Foothills Art Center for an exhibition that runs through July 25th. He constructs massive installations from wood, foam and concrete. This show displays a wide variety of his work including outdoor installations, extremely large room-sized unique constructions and some new pieces never before seen. More info here. Golden’s got your Golden Ticket…Summer is a perfect time to stroll the streets of Golden, grab a coffee or drink on a patio, shop for a summer outfit or pick up a present for someone special. So when you’re going to cruise around Golden, start at the Visitors Center to request a Golden Ticket. Read more about this unique scratch off discount program here.